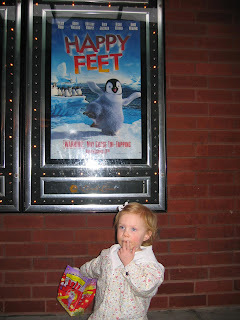 We took a Laura a few weeks ago to see "Happy Feet". We lasted about 45 minutes..she loved the penguins, but mainly the popcorn! 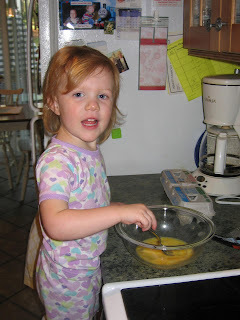 One of her favorite activities is making eggs. She insists on being involved in the cracking and the stirring. The minute I pull the eggs out of the refrigerator, she is dragging the kitchen chair across the floor to be my helper. Laura loves her new water table so much that she has decided to call it her "hot tub". She learned this new word a few weeks ago when we were with some friends in their hot tub. She is adorable! I cannot wait for Nora to get big enough to do things! Right now, all she can do is put things where they are supposed to go (when I point to the specific spot and say, "Put it back"). I guess that is something. Before too long, she will be big and helping me a ton with a new baby :). Great to hear from you. Your little girl is so cute. It looks like you are having a fun time being a mom. 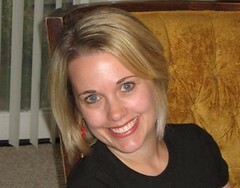 I just got a note from Eli and look forward to talking with them. It truly is a small world. Take care. 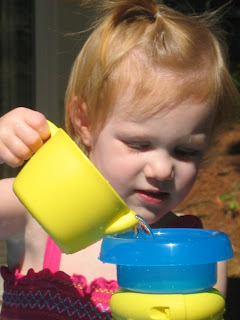 All the pictures are darling, but my favorite is Laura in her water table. I love the fact that she enjoyed the hot tub so much! We definately need to plan to do that again soon. See ya tomorrow!